The 'Single Palm Change', represents the dragon's head. Consecutively the dragon's body is made up of 8 forms - Snake Palm, Dragon Palm, Tiger Palm, Swallow Palm, Turning the Back Palm, Twisting the Body Palm, Swinging and Turning Over the Body Palms; and finally we have the dragon's tail, made up from 5 dragon palms named 'Black Dragon Swings Its Tail'. The Movement 'Black Dragon Swings Its Tail' represents the tail of the Dragon and therefore the closing and collecting movement of the previous palms. 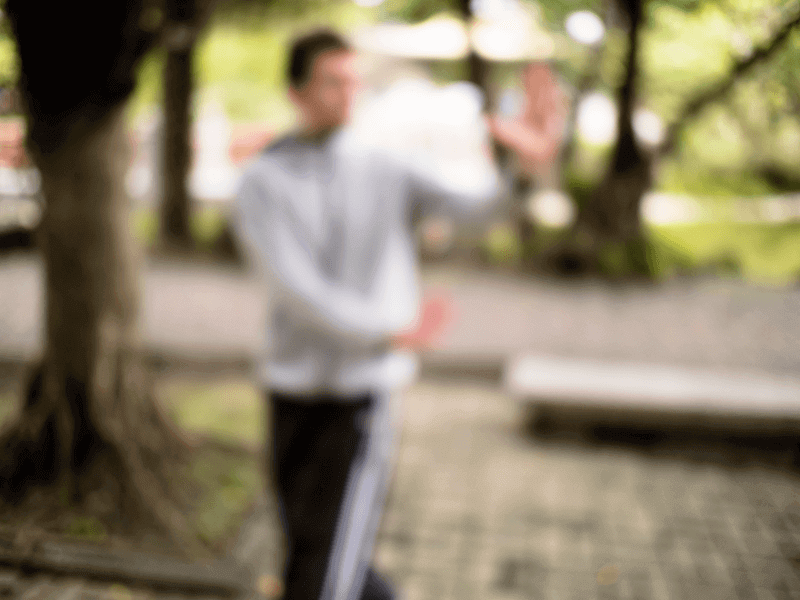 The movements or 'Palm Changes' of Pre-Heaven Bagua Zhang should be smooth and soft; yet within their softness there remains a solid structure. The emphasis is on uniting the upper and lower body, the inside and outside, into one single power. Internal structure and strength must always been guarded; hasty or clumsy movements should be avoided. 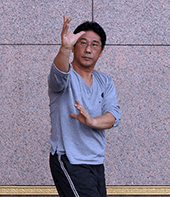 The spiral movements of the circle walking exercise of Bagua's 'Pre-Heaven' palm changes are practiced in order to combine inside, outside, structure, intent, strength, and power. While circle walking, inside and outside should be combined and move naturally; body, intent, strength and qi are the four pillars which are the foundation for explosive internal power. In all these circular, twisting, and turning movements, one practices sinking, stability, roundness and heaviness. When mud stepping, the upper body is twisted towards the center of the circle, while the lower abdomen is naturally drawn in. Out of this posture, internal power is created. The slow walking will nourish internal strength and energy. The rolling and winding hands of the Pre-Heaven palms; the circular and round stepping; churning up and down of the body all will serve to connect and activate the muscle groups and sinews; the whole body will then naturally move as one unit to develop a more effective power. During practice, one should calm down all disturbing thoughts and worries. One should stay focused throughout the exercise. Movements are led by the intent; they are continuous, as if lined up on a chain. The major movements of Baguazhang are Walking, Turning, Twisting, and Swinging. The aim of practice is to make inside and outside movement as one; to coordinate the soft and hard. The whole body should work in harmony and contain a limitless spiraling strength. During exercise, body and mind should be in a state of readiness. The qi must sink into a region of the lower abdomen, named 'Dantian' (Dantian, dan t'ian, dan tien or tan t'ien is loosely translated as "elixir field", "sea of qi", or simply "energy center", Dantians are important focal points for meditation and exercise techniques found in kung fu systems, as well as qigong, and in traditional Chinese medicine), it is here the spirit must be collected and preserved. While practicing stance holding or other meditative exercises, one must be firm like a mountain. While moving the body should be smooth and nimble like that of a dragon or a snake. When Twisting, Turning, Walking, Swinging, Trapping, Bending, or Mud Stepping the waist and legs are paramount. When kicking, legs must be forcefully stretched out. Movements must be natural and firm at the same time. After practicing these exercises for a long time, skill and power will see great improvement. After regular and dedicated practice, the arms work in harmony with each other, becoming nimble and powerful--no matter if striking high or low; stretching or closing; or striking to the left or the right. The legs develop in the same way; they feint or attack, always following the mind and its will. The legs should be practiced first, followed by body-movement, and finally the hands. First one should practice steady and solid movements before learning skillful methods such as how to feint a strike or movement. Firm and heavy movements are the foundation of light and nimble techniques. In practice, one should be patient and move forward according to one's abilities. A good and powerful art cannot be achieved through haste or shortcuts.